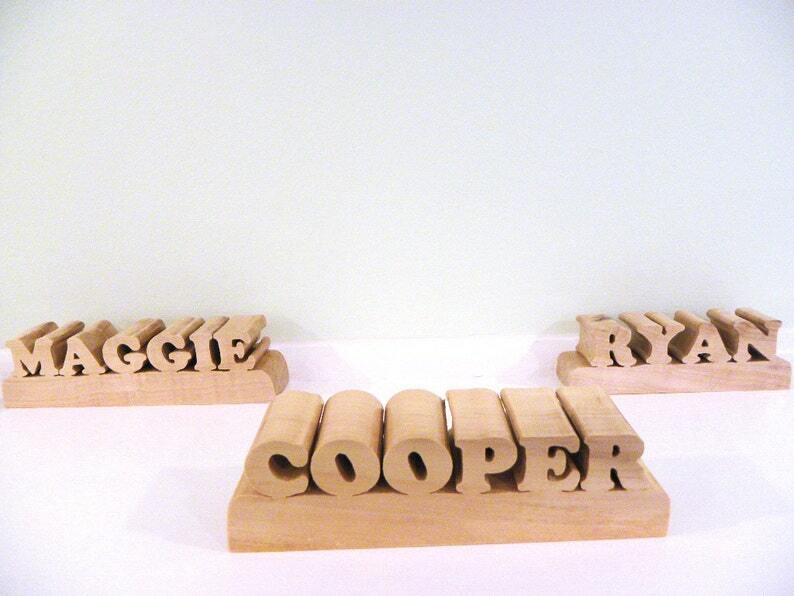 Here’s your chance to have your personalized name wood sign. Can also be used for customized numbers. This wood sign makes a great teacher gift, housewarming gift, shower gift, graduation gift or wedding gift. Each custom wooden sign is handcrafted from a recycled tree which will result in one-of-a-kind variations. Can be displayed on a desk, door, or wall (hook not included). •	Each scrolled letter, number or punctuation mark counts as one character. E.g. Mrs. Smith would count as nine (9) characters (period counts). •	Maximum number of characters is 16. •	Spaces do not count as a character. •	Can be done in all upper case, all lower case or a mixture of both upper and lower case. •	For a bolder look, we recommend all capital letters. The letters/numbers are hand scrolled using the artist's talent, time and patience - not a computerized machine. Teachers' Appreciation Week is the first full week of May. Teachers' Appreciation Day is the Tuesday of Teachers' Appreciation Week. 1. Since this is a custom item, please include your phone number in the "Notes" section should the Seller have a question. Your phone number will not be sold or otherwise shared. If the Seller has questions about your order he will convo/email first and then attempt a phone call. If Seller has a question and is unable to reach the Buyer, the Buyer's money will be refunded using the same method of payment. 2. Please remember to include the name you want EXACTLY as it should be scrolled. If you want a bolder look, use all capital letters for your request. If you prefer mixing capital letters with lower case letters, type your request that way. 3. This is a custom item; therefore no returns or refunds unless Seller makes an error in the spelling. 4. This item will take approximately 1-2 weeks to make, finish and ship. USPS will take another week to deliver. Total time until the piece reaches your door is approximately 2-3 weeks. All woodwork has been handmade by Bruce in his home studio. Unless otherwise noted, the wood comes from recycled trees. Out of the Woods-USA does NOT work with outside manufacturers, employ anyone to design or produce, use automated machinery, computer assisted tools, lasers or kits to make any artwork. The bottom line is that the buyer is getting one-of-a-kind fine woodcrafts made by an American artist from start to finish in his one man shop. I loved my custom name in wood sign! Thank you so much, it was perfect! Repeat customer. Thank you for a beautifully designed piece. The edges are smooth and I like the color of the stain. Out of the WoodsUSA accepts payment via Direct Checkout or PayPal, which includes payments made by credit or debit card. This is super easy if you have a PayPal account; however, if you do not have a PayPal account, you may still be able to pay for your purchase with a credit or debit card using PayPal's guest checkout service. Sorry, checks and money orders are not accepted at this time. If you’re not happy, we’re not happy! We want you to love your purchase. If you do not, you have seven (7) calendar days of receipt to notify Out of the WoodsUSA via convo and 14 calendar days to return the item. The cost to return an item to Out of the WoodsUSA is the responsibility of the Buyer. All returns must have a return convo - please do not return your purchase without convoing first – it will not be accepted and no refund will be issued. All returns must be sent using a tracking method and insured at the Buyers expense. If the Buyer does not request tracking service and the return is not received by Out of the WoodsUSA, the Buyer will not be credited for the return. If an item is returned, it must be in the same condition as it was when it was shipped. Refunds will be made within seven (7) days of receiving the returned item. The original shipping and handling charge will not be refunded. Buyer pays all shipping related costs and expenses including costs involved with reshipping and tracking. Shipping charges are non-refundable once item has been shipped. Items are shipped via United States Postal Service (USPS) First Class Mail in a single mailing box unless otherwise specified. If buyer requests shipping via an alternate method, requests shipping to more than one address or requests the item to be double boxed, the shipping costs are subject to change. Once payment is received, the package is typically taken to the USPS on the next business day. If shipping is delayed, Buyer will be notified via convo and will have the option to cancel the order. Out of the WoodsUSA will provide Buyer with the tracking number once the item is shipped. If the tracking information indicates the item was delivered and the Buyer indicates the item was not received, the Buyer will be asked to check with housemates / neighbors to determine if the package was picked up accidentally and / or the USPS to determine if the package was misdelivered. If tracking indicates the package was delivered and the Buyer cannot find it, the Buyer will be advised to file a police report with his/her local police department and report the theft to the Postal Inspection Service. If the Buyer is not home to receive the ordered item(s), the USPS may leave a notice that the package needs to be picked up or they may leave the package. If a notice is left and Buyer does not pick up the package, it will be returned to Seller no sooner than 21 days and no later than 180 days. During that time, Seller will make three attempts to reach the Buyer via email and/or convo. If the package is returned to Seller and Buyer wants the item reshipped, the Buyer will be responsible for the extra shipping charges and Etsy fees before the item is reshipped. The reshipping charges can be paid via PayPal. If the package is returned to Seller with no communication from Buyer, Seller will issue a refund minus the shipping costs. Packages that are refused by Buyer, sent back and received by Seller, will be refunded for the item only. Custom orders are not returnable or refundable. Shipping charges will not be reimbursed. Buyer will not receive a refund of any kind if the package is refused by Buyer and returned to Seller but not received. Orders will be shipped to the shipping address on the Etsy Order page or PayPal Transaction Details Page. Before placing an order, the Buyer must be sure his/her shipping address is up-to-date and is actually where they want the item to be shipped. If the shipping address on the Etsy Order page / PayPal Transaction Details Page is different from the shipping address specified in the Buyer's account, the item will not be shipped. The Buyer will be asked via convo to cancel the order, make the correction and reorder. If the order is to be sent to another recipient, the Buyer will need to add the recipient's shipping address to their Etsy / PayPal account and select as the shipping address for the order. PayPal User Agreement which can be found at www.paypal.com/webapps/mpp/ua/useragreement-full?country.x=US&locale.x=en_US#11. Section 11. In the order confirmation, Seller will restate the shipping address provided by Buyer. Seller packages the order within 60 minutes of order confirmation. The package is shipped immediately or the next USPS business day. Buyer should look for the Seller’s convo to confirm the shipping address. If the package is returned to Seller because of an incorrect address provided by Buyer, Seller will refund the cost of the item, but not shipping. If the package is lost due to an incorrect address provided by the Buyer, no refund will be made. If the Buyer wants the item reshipped, he/she can reorder providing the correct shipping address. If the package was shipped to an incorrect address at the fault of the Seller, the Seller will reship at no cost to the Buyer. No refunds, returns, exchanges, replacements will be made if the required photos are not received within seven (7) calendar days. Once the required photos are received by Out of the WoodsUSA, Buyer will be issued a refund via the same method of payment. Alternately, it may be possible for Out of the Woods - USA to recreate the item; however, if this is agreed upon by both Buyer and Seller, it could take up to six (6) weeks. Buyer must hold onto the damaged item and packaging for six (6) weeks in case the USPS asks to see the damaged item / packaging. 1. Buyer can select another item from Out of the WoodsUSA of equal of lesser value. If the item is of lesser value, Buyer will be refunded the difference via the same method of payment as original purchase. If the item is of higher value, Buyer and Seller can work out a payment method. If the cost to ship the item is less than the original shipping cost, Seller will refund the Buyer. If the cost to ship the item is higher than the original shipping cost, Buyer and Seller can work out a payment method. 2. Buyer can request a remake. If the Seller agrees, this can take up to 8 weeks to complete. The item will be reshipped at no cost to the Buyer. 3. Buyer will be refunded via the same method of payment as original purchase. The refund will include shipping costs. Seller will ship item(s) via USPS First-Class Mail International within one business day of receipt of order. While most items should arrive in 2-3 weeks, occasionally items take longer due to a delay in customs. This delay is beyond the control of the Seller. Seller is not responsible for delays due to shipping and customs. If your order is a gift that is being sent directly to the recipient, you will need to add the recipient's shipping address to your PalPal account and check that address as the address you want the item shipped to. Please specify in your instructions where you want the receipt to be mailed to. If you do not specify, the receipt will be included in the package. A confirmation of your order will be sent via email and/or convo within 24 hours (or less) of being received. If there are questions or issues regarding your order an email and/or convo will be sent and your order held until you respond. If you do not check your email frequently, please provide a phone number so that your order can be shipped on the next USPS business day. What does copyright mean? A form of protection provided to those who create “original works of authorship”. Copyright law provides the owner with specific rights, including the right to reproduce their work, distribute copies of their work, prepare derivative material based on their work, and perform or display their work publically. All artwork, reproductions, images and descriptions are copyrighted © by Out of the WoodsUSA. All rights reserved. No one may reproduce any copyrighted work in print, video or digital form in violation of the law. Out of the WoodsUSA works are considered protected even if they are not registered with the U.S. Copyright Office and even if they do not carry the copyright ©. Copyrighted works include, but are not limited to the following: printed articles from publications/forums/blogs, public and private forms of media, photographs, educational/teaching materials, books, documentation, and World Wide Web pages. In general, the laws that apply to printed materials also apply to Internet pages. Some of the items look like toys - are they safe for children to play with? The items found on Out of the Woods–USA are not intended as toys and should not be played with or handled by children. Items are a choking hazard to children. Children can swallow small parts or experience cuts and / or splinters from sharp edges of the wood. Fingers can be pinched in lids. The finish on the pieces can easily shed if chewed or sucked on. Out of the Woods-USA does not sell toys. The pieces are meant for decoration only. If handled as a toy the delicate and fragile artwork and sculptures will break. I received my item with a crack/mark - is my item broken or flawed? Each piece of wood is unique - just as no two trees are alike. The finest hardwoods have natural characteristics such as: closed knots - a blackish blue streak called mineral streak; telegraphing - some darkened grain shows through the stain; and/or birds eye - small brownish dots. None of these appearances are to be considered flaws, blemishes or imperfections, but rather, examples of the beauties of Mother Nature. Wood is in constant state of expansion and contraction depending on your home’s humidity. This normal movement may cause some hairline cracks - this is a natural occurrence. Please look at the pictures carefully before ordering to be sure that you will be satisfied with any of the naturally occurring distinctions. Are your bowls, baskets, spoons and ladles food safe? How do I care for my bowls? Anything finished with block and cutting board oil IS food safe. According to manufacturers of lacquer and shellac, their products have not been approved as food safe. With that said, many bowls purchased from stores are finished with either lacquer or shellac and are used for food. Out of the Woods–USA does not promote anything finished with lacquer or shellac as being food safe. Hand wash with a wood oil soap and warm water only. Never soak anything in water or wash in a dishwasher. What about shipping costs? What method of shipping is used? Buyer pays all shipping related costs and expenses including costs involved with reshipping. Shipping charges are non-refundable once item has been shipped. Items are shipped via United States Postal Service (USPS) Priority Mail in a single mailing box unless otherwise specified. If buyer requests shipping via an alternate method or double boxed, the shipping costs are subject to change. Tell me about Priority Mail Package Delivery. How long will it take for me to receive my package? Will I receive a tracking number for my package? Once payment is received, the package is typically taken to the USPS on the next business day. If shipping is delayed, Buyer will be notified via convo & will have the option to cancel the order. Seller will provide Buyer with the tracking number once the item is shipped. If the tracking information indicates the item was delivered & the Buyer indicates the item was not received, the Buyer will be asked to check with housemates / neighbors to determine if the package was picked up accidentally & / or the USPS to determine if the package was misdelivered. If the package cannot be located, the Buyer will be advised to file a police report with his/her local police department & report the theft to the Postal Inspection Service. What if my package is shipped to an incorrect address? Can I ship to more than one address? If the package was shipped to an incorrect address at the fault of the Seller, the Seller will reship at no cost to the Buyer. It is the Seller’s fault if he does not ship to the address shown on the order. Buyer is responsible for providing the correct shipping address. If the package was shipped to an incorrect address supplied by the Buyer, the Seller will refund the Buyer for the cost of the item only and only once the package is in the procession of the Seller. If the Buyer wants the item reshipped, he or she can reorder providing the correct shipping address. Shipping costs are based on shipping the entire order to one address. If the buyer requests the order to be shipped to two addresses, shipping cost will be double. Can I ship my package to an address other than my own? PayPal orders will be shipped to the address on PayPal Transaction Details Page. If that address differs from the address in Buyer's Etsy account, the item will not be shipped. The Buyer will be asked to cancel the order, make the correction & reorder. If the order is to be sent to another recipient, the Buyer will need to add the recipient's shipping address to their PayPal account & select as the address for the order. These instructions follow PayPal User Agreement, which can be found at www.paypal.com/webapps/mpp/ua/useragreement-full?country.x=US&locale.x=en_US#11. Direct Payment orders can be shipped to another address upon request. What if my item is damaged during shipping? Once the photos are received, Buyer will be issued a refund via the same method of payment. Alternately, it may be possible for Seller to recreate the item; however, if this is agreed upon by both Buyer & Seller, it could take up to six (6) weeks. Buyer must hold onto the damaged item & packaging for six (6) weeks in case the USPS asks to see the damaged item / packaging. 1. Select another item from shop. If item is of lesser value, Seller will refund via same method of payment as original purchase. If item is of higher value, Buyer & Seller can work out payment. If cost to ship item is less than original shipping cost, Seller will refund. If cost to ship item is higher than original shipping cost, Buyer & Seller can work out payment. 2. Request a remake. If Seller agrees, can take up to 8 weeks to complete. Item will be reshipped at no cost to Buyer. 3. Buyer will be refunded via same method of payment as original purchase.